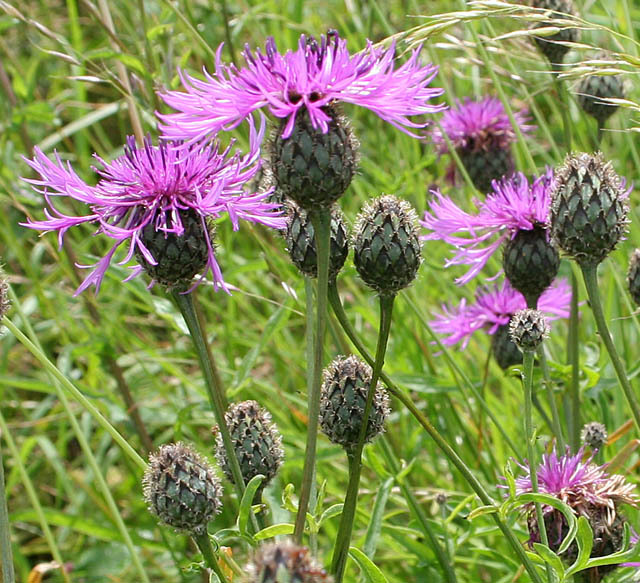 Centaurea nigra (Common knapweed). commons.wikimedia.org (Accessed 12/2027). Centaurea nigra is a perennial herb, 20-80 cm tall, very much like C. jacea, rough-hairy, young plant sometimes cobwebby. Leaves alternate, leaves of winter rosette stalked, variable, 1.5-4 cm wide stem leaves alternate, lance-shaped, sometimes toothed or lobed, becoming smaller upward, the uppermost becoming small bracts. Flowers pink-purple, all tubular, and about the same size, bracteate base 1.5-2 cm long and wide, bracts wide, tips with blackish, irregularly long-fringed, appendage fringe longer than blade of appendage, June-Sept.